So I’m parked behind a police car. He’s eating a sandwich. I’m eating a sandwich. And I’m thinking: how good is my aim? I could pull up to his window like I’m parallel parking and just sort of chuck my sandwich at his driver side door and speed off. No, that’s no good. I’d probably hit him by accident. He’d be so miffed at having mustard on his chin he’d charge me with assaulting an officer just to make a point. Okay, fine. But what if I drive by really, really slowly and pull a gangster face, and then speed away? He’d chase me, surely. So I open my visor mirror to test out some gangster faces. My best gangster face just looks like constipated-prissy-girl. I scrunch my nose and snap the visor shut. It’s 12:45 on a weekday. I chew on my sandwich and look around. People chat over lunch at outdoor tables. Couples cross at the crosswalk. I don’t want anybody to get hurt, of course. So how can I write a high speed chase scene without experiencing a high speed chase? Maybe I can get this nice officer to pursue me at fifteen mph? Then no one gets hurt. And maybe I avoid the reckless endangerment charges. The officer, the real officer, finishes his sandwich. He crumples the wrapping paper into a ball, tosses it out the window where it lands on an overflowing trash bin. His aim is better than mine would be. He speeds off, and with him go my hopes of writing a realistic chase scene. You know something’s wrong when you consider jail time just to get a story written. Why would this crime-averse gal ever consider criminal charges? The main characters in of my stories finds himself in conflict with a local biker gang. They’re outnumbered, outgunned, and completely out of their depth. So what do they do? They run. Which is great. But I’ve never been in a car chase. So how could I write one? It was an unsolvable problem. But I couldn’t bow to defeat. The contest, my publishing dreams, hell the story alone was too important to give up now. This is my dream, we’re talking about! If you’re anything like me, your characters get into shenanigans you wouldn’t approach with a bullwhip and twenty inches of steel armor. So forget “write what you know,” because with YouTube you can write what you want and still have the details to support it. Type “car chase” into YouTube’s search bar and a million experiences appear at your fingertips. The instant winner was my story in spades. Compelling action, story arc, motorcycles, and edge-of-your-seat, can’t-look-away drama. It’s almost hard to believe it happened in real life. Be warned, YouTube isn’t all fluffy bunnies and cats playing the piano. What you see might disturb you. The video below isn’t some high production movie shot on safety rails in HD. It’s real life. And these men really get hurt. It’s worth examining, though, for several reasons. First, it unfolds like a movie with a beginning, middle, and end. Second, when it presses all your instinctive buttons you know without hesitation which details to include. Third, it reminds you how quickly minor scrapes combust into life-threatening ordeals. Your characters make stupid decisions like people make stupid decisions. In this video, the Range Rover driver thinks he’s safely anonymous on a busy freeway. The bikers think they’re safe in a pack. By the end, both parties realize how wrong—and how vulnerable—they really are. Watch the video and then join me after to find out how you can transform videos like this into story scenes so rich in detail, your readers will think it happened to them. What kind of scene are you writing? Type that into YouTube’s search bar. Get creative with your search terms. I tried “motorcycle chase,” of course. But I didn’t hit pay dirt until I branched out to “biker gang car chase.” Try a few things until something clicks. This step is more art than science. And that’s reason enough to have fun. What’s better than watching videos on YouTube and calling it work? You’ll know you found The One when one of two things happens. You lean forward in your seat. Story ideas flow. Or spark. Or anything. At this point, grab your notebook or the free worksheet below and start writing. Be ready to hit pause so you can jot down the play-by-play. Here’s what to write down. 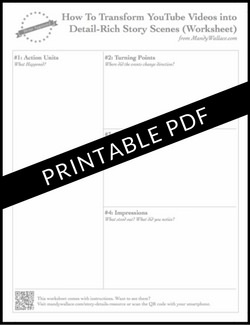 Print the free story details worksheet to make this even easier. Create separate sections in your notes for: action units, turning points, sensory details, and impressions. Or print the free worksheet above. The sections in this worksheet are already made for you. No need to get fancy in this section. Just write down the facts. Easiest is to write a numbered list. #1: This happened. #2 That happened. Each number on the list should be its own unit of action on its own line. Biker one slows down in front of Range Rover and taps bumpers. Other bikers slow to stop on highway. Biker two gets off motorcycle and walks toward Range Rover. Range Rover driver panics and rabbits. Highlight the turning point moments in your list. They’re easy to find if you look for where the story changed direction or meaning. These moments are of vital importance because they are your plot. They’re the moments of greatest drama and suspense. And they’re the moments that you, the writer, must focus on in detail. This is where the magic happens in fiction. 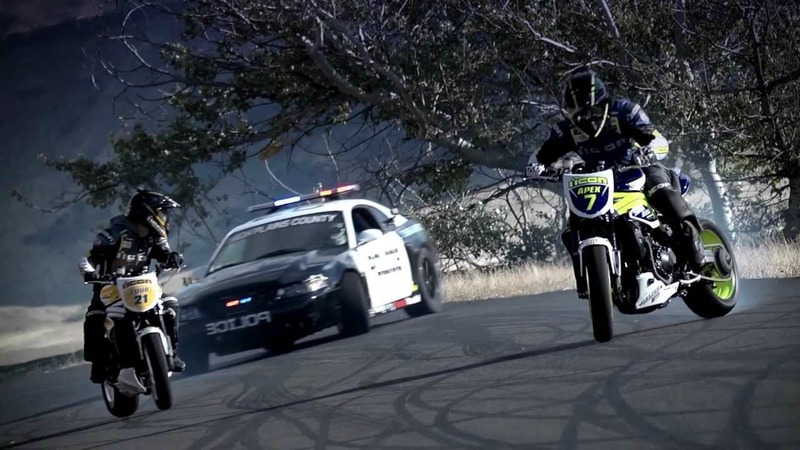 The Range Rover runs over the bikes to escape (this moment transforms a single biker’s cocky display into a dangerous high speed chase). The parties hit a slow intersection, and the bikers jump off their bikes (this moment transforms the car chase into a potentially violent confrontation). The Range Rover escapes again (this moment transforms a potentially violent confrontation back into a car chase). The parties hit traffic, and the Range Rover is a sitting duck (this moment transforms the car chase into what would be the climax of the incident: the biker gang’s violent revenge). In YouTube videos, you get sight and sound. That’s a great start. But don’t stop there. Sights and sounds can help you intuit other sensory information. Also ask yourself what new elements look and sound like when they enter the camera frame. Here’s what I mean. Skyscrapers seem to erupt from the sidelines. Engine revs sound like angry screams. Trees throw shade over the freeway, and the black Range Rover gets lost in the dark. The bikers rev their engines and take off, and I think it might smell like burned rubber. When the bike tail skids, I think of what the rumble would feel like. Brake lights glow like eyes ahead. Is it hot under those helmets? Does sweat get into anyone’s eyes? This is where you write down anything that stands out. Associations you make. Themes, symbols, or motifs you might explore. The Range Rover reminded me of a beetle amidst a battle swarm of ants. So I wrote down exactly what gave me that impression: the biker’s insect-like helmet heads, the fact that I couldn’t see anyone’s eyes, the size of the tank-like Range Rover compared to the smaller but numerous bikers. This parallel to animal behavior could become a symbol of losing humanity through violence. Homer did this in The Iliad, and it works just as well today. When one biker struggles to get his bike going it reminded me of old cartoons who run in place a few seconds before taking off. The conflicting feelings, humor and anxiety, added emotional complexity to my response. That means it’s a great way to illicit that same complex response from your readers. The sea of brake lights at the end felt like someone signaling “stop the violence” or “this is the end for you, Range Rover.” I could use this as a symbol in my story. Plug the turning points from step two above into your story to form a plot skeleton. Flesh out your plot skeleton with the details from steps one, three, and four. For each turning point or action unit you write in, include your characters’ reactions. What do they do, say, and feel? Write that down. You’ll weave these in and smooth them out when you edit your story later. Yes, this video is real life. It happened to real people who really got hurt. That doesn’t mean you should feel guilty for transforming it into a story. Here’s why. It’s your job as a writer or artist to find meaning in the chaos of life. To find moments of redemption in human suffering. To be the salve that helps people make sense of meaningless events. But to speak to people—to reach readers’ hearts—you have to entertain them first. That’s the nature of stories. You give people what they want (entertainment), so you can give them what they need (meaning). The sooner you get comfortable with this, the sooner you can help people. Did you grab your free story details worksheet? I have used You Tube for a story–a kidnap game. there is actually a company you can hire to kidnap yourself or a friend. Expensive, answer questions about how rough and where to get the victim etc. The emotive reaction is stronger than I expected, and I wondered who in the NSA knew I had made a series of searches for abductions. this takes listening to people talk in a coffee house up a few notches. If someone hired kidnappers as a prank I would never forgive them! I may be too sensitive, but that sounds terrible. And even so I’m kind of chuckling at the idea. Interesting to think about. I am very grateful for all the work you put into this single post, not to name so many others. Not just you offer a very helpful worksheet, that I intend to use (though I am more intuitive than an organized writer) — you proceed in a step by step explanation of how to use it, with savory examples. The initial story is catchy in itself. I see you have a post on Pinterest, and that’s what I am reading next — I’ve been using it as my main source of inspiration. I usually need just a picture to spark a scene, an event, and then imagination fills the sense impressions, emotions, feelings, etc. To be honest, a video tends to trap me as an inspiration source. You are the giver here, I am the taker, but still, a very grateful one. Your work is important and appreciated. Thanks for the youtube tip! Happy to help out, DB!